Photo from Parade of Life Through The Ages, by Charles Knight, Nat. Geo., Feb. 1942. Adventurer, administrator, and Museum promoter — Andrews (Jan. 26, 1884 – March 11, 1960) spent his entire career at the American Museum of Natural History, where he rose through the ranks from departmental assistant, to expedition organizer, to Museum director. He became world famous as leader of the Central Asiatic Expeditions, a series of expeditions to Mongolia that collected, among other things, dinosaur eggs. 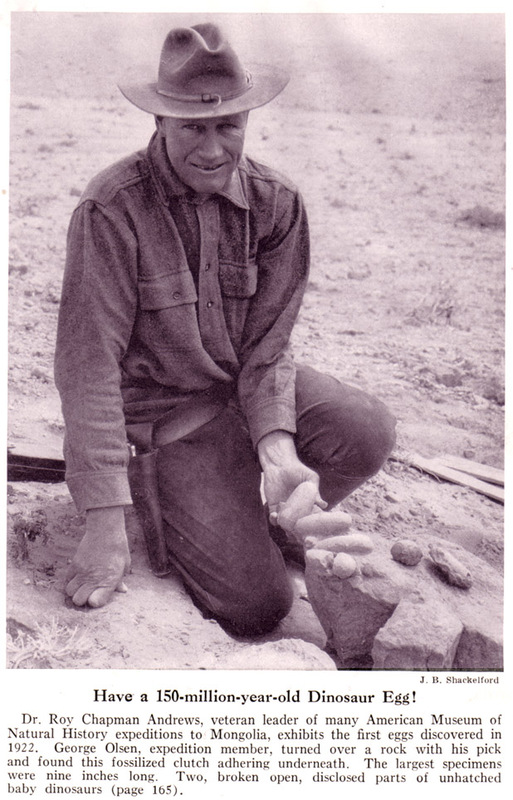 Although on these expeditions, Andrews himself found few fossils, and during his career he was not known as an influential scientist, he instead filled the role of promoter, creating immense excitement and successfully advancing the research and exhibition goals of the museum. Learn about the Roy Chapman Andrews Society HERE.